FT-TEC Electronics develops and distributes automatic identification systems (AIS), and marine accessories. The company’s high-tech products aim to provide maritime safety and information, as well as offering the utmost comfort for members of the shipping industry. In the FT-TEC factory in Austria, the company is constantly developing new concepts for commercial, emergency and tracking systems for oil rigs, and shipping applications. FT-TEC Electronics has developed the first SEAANGEL SA16+, as well as the SEAANGEL SA14 SART, professional, Safety of Life at Sea (SOLAS) certified location devices for professional seafaring that transmit a distress signal via AIS frequencies, more than up to ten sea miles, for 96h. The distress signal is activated by pressing a button on the device, or automatically via a self-timer or rip cord. 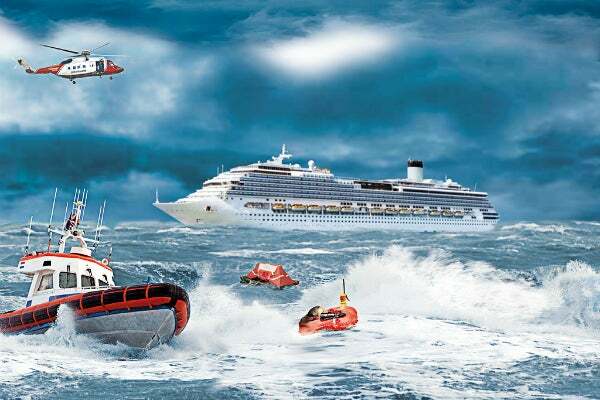 Each ship is equipped with AIS, but stations on the shore, or search and rescue aircraft at a distance of up to ten sea miles can also receive the accident victim’s GPS position and initiate pinpoint salvage. The integrated lithium-manganese-dioxide batteries have a service life of five years, and the range of application, from -20° to 55°, ensures a high degree of reliability. The scope of delivery of the compact device, that weighs 190g and measures 138mm x 65mm x 25mm (RRP €532.50 excluding VAT), is comprised of a multipurpose assembly kit, and a telescopic rod, enabling the transmission of signals by radio one metre above water level. FT-TEC Electronics has developed a budget-price variant of the member-over-board (MOB) system specialised for oil rigs, sailors, tug boat operators, and motor yachtsmen. The SEAANGEL SA14 MOB transmits an AIS distress signal with a range of up to ten sea miles for at least 72h, with a battery life of seven years. The new AIS FLARE is the first miniature emergency transmitter that complies with EU-wide standards. It also uses AIS frequencies, allowing for a range of up to ten sea miles, transmitting for at least 36h at -20°. FT-TEC Electronics also offers an expanded range of SEANEXX AIS receivers and data appliances. The MOBILE AIS is a battery-powered, dual-channel AIS receiver with wireless connectivity via Wi-Fi. The battery allows for 20h of independent usage and offers an integrated LED torch. The compact SEANEXX AIS USB stick is a comprehensive dual-channel AIS receiver in the size of a USB stick. The equipment plugs into a standard USB port on laptops and PCs, and is compatible with computer-based navigation software, such as OpenCPN. It is also available as a set with a clip-antenna, which is easily installed without assembly. The SEANEXX DATA SERVER combines AIS, a GPS receiver, and NMEA multiplexer functionality in one unit. AIS information and GPS positional data is combined with NMEA instrument data (depth, speed and wind speed) and converted into one data stream which can be transmitted wirelessly to up to ten clients, including iPads and other tablets, smartphones, laptops, and Wi-Fi-enabled plotters, simultaneously or conventionally via NMEA or USB. The data logger stores processed data on an SD-card. The package with the Triducer from Airmar is designed to be used with Apple, Android or Windows tablets. The SEANEXX DATA SERVER is fully compatible with any NMEA0183 sensor. The SEANEXX AIS RECEIVER contains a dual channel AIS receiver and an integrated 72-channel GPS receiver. The receiver is available as AIS only, or as an AIS / GPS combo receiver. FT-TEC Electronics is based in Neutal, Austria, and was founded in 2014 as part of the FT-TEC Group. The company develops and produces innovative emergency systems for professional seamen and recreational boaters. The high-quality products exclusively designed and manufactured in Austria are exported worldwide. FT-TEC was founded by Friedrich Trobolowitsch in 2005 and is a privately owned company. FT-TEC Holding is a combination of three companies; FT-TEC Electronics, FT-TEC Production and FT-TEC Trading. The subsidiaries offer highly specialised products from the plastic, elastomer and electronics industries. Their clients include companies from the railway, transponder and the automotive sectors.